Oil on board 24" x 16 1/2"
Well this painting turned out to be a real challenge for me, having never painted a horse before or even a white subject, there was surely a lot to learn. The main problem areas were the colour of the shadow areas and the reflected light. 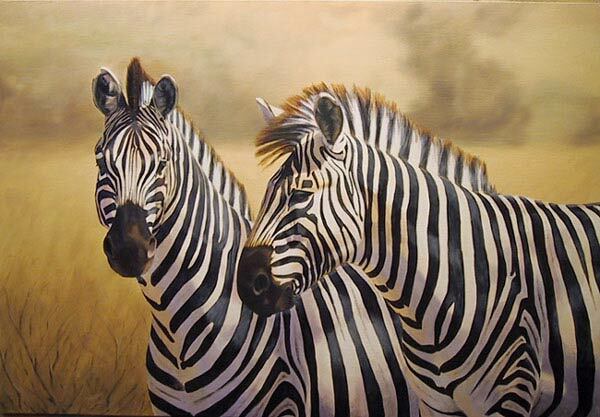 I deliberately kept the background blurry to concentrate the viewers eye on the main subject - the zebras, that said I felt that the painting benefited from have some mid-distance in the form of the bush bottom left. All in all I think it turned out all right, but I don't think I'll be in any rush to paint lots of stripes again for a while! Jason Morgan may be reached via email at alias@onlineart.f9.co.uk. Web pages and artwork at this site may not be duplicated or redistributed in any form without express permission.